Butterflies and Heart Songs: Extra Extra ... Read All About It! This news is about a baby - but not the Prince of Cambridge (whose name, I believe, is George). When I got all the scut work completed I came up with time to actually think about more particulars of my upcoming adventure. I've been planning all along to install a motor scooter-type bike rack with a ramp on the back of Miss Flair. A hassle while we were in Mexico was that I was dependent on others for rides - into towns, to buy groceries, etc. So, I've been doing a little research and decided to try out a Smart Car. You guessed it! I bought her this morning! She's very cute and I'm thinking of naming her 'Petunia,' but that's not for absolute sure at this time. Here are a couple of photos of her next to Miss Flair (permanent name to be determined - along the way). She just sidled right up to Miss Flair and looks very comfortable. There's actually a lot of leg space for the driver and passenger - only enough room in back for three or four bags of groceries. She has an 'assisted' manual transmission, sun roof, air-conditioning, radio and CD and gets great gas mileage. She's a 2008 model with only 13K miles. She looks pretty content to have joined our family; Lacy was with me when I tried her out - I had to make sure she'd fit in the car! She gave her approval and away we went - Lacy looking cool, calm and collected as co-pilot. Nice, pretty much all set now! Yes, just a few odds and ends now. Let the adventure begin! Wow. You are definitely ready to see most of the world. But a car like that in your California traffic. Are you sure? Anyway, good luck. I try diligently to avoid california traffic whenever I can. I've spent enough time in commute traffic for two lifetimes. San Francisco's a great city - but commuting is my worst memory. I say, Try to drive before 6am, after 10am, before 4pm and after 7pm. Doesn't always work and it's not nearly as stressful here in Roseville/Sacramento. But the Bay Area -yuck! So cool - Doug is jealous! I always tell him that my legs won't fit in one!! Plus she is all pimped out and fancy!! Good for you!! Interesting, Nancy, the sales guy was about 6'4" and he said he felt comfortable. The really short part of the car is the rear. Behind the two seats is a very small 'luggage compartment.' My bum knee felt better in the Smart car then it does driving the RV because the configuration of the driver's area makes it necessary for my to keep my right knee bent - and it just doesn't like that. I'm going to physical therapy on Friday to see if there're any exercises I can do to help. Otherwise, and totally acceptable to me, I need to break up the driving and take little walks from time to time. And this whole part of my life is smelling the roses now - so unlike my career of emergencies every darn day! I purposefully drove it home on the freeway for about 10 miles just to see how it handles. It really can scoot. And, it seems like I have so much lane room - because I do! And, Mister Ed and Miss Sheri, I'm hoping I'll NEVER have to mow another lawn! Not that I've mowed that many - but it's a hard and almost thankless job in my book. The green stuff just grows back in the blink of a eye. Good buy. You won't even know it is behind you (except when you look in the backup monitor). You know, it's only 8 feet and change long! I'll have to have the backup camera shooting down to even see it there! I've never towed a vehicle but have, many long years ago, towed a boat. I assume it's a similar thing. We'll find out! Assuming you are towing with all four wheels down, the only difference between towing a car and a boat or trailer is that you cannot back up with the car attached. If you do, the front wheels of the car turn the wrong way and it will put extreme stress on the steering components and/or the tow bar. Now I have backed up like a foot or two "if" the car and motorhome are both headed straight. When we had our American Eagle there were a few times that I could not make the full turn around in a parking lot and had to unhook the tow car, move it out of the way, turn the motorhome around, and hook it back up. So just be careful of where you are, especially in parking lots, and oh ya...once our GPS took us down the wrong road and there was no way to turn around without unhooking the tow car. Hi Dave ... Good advice, thanks. 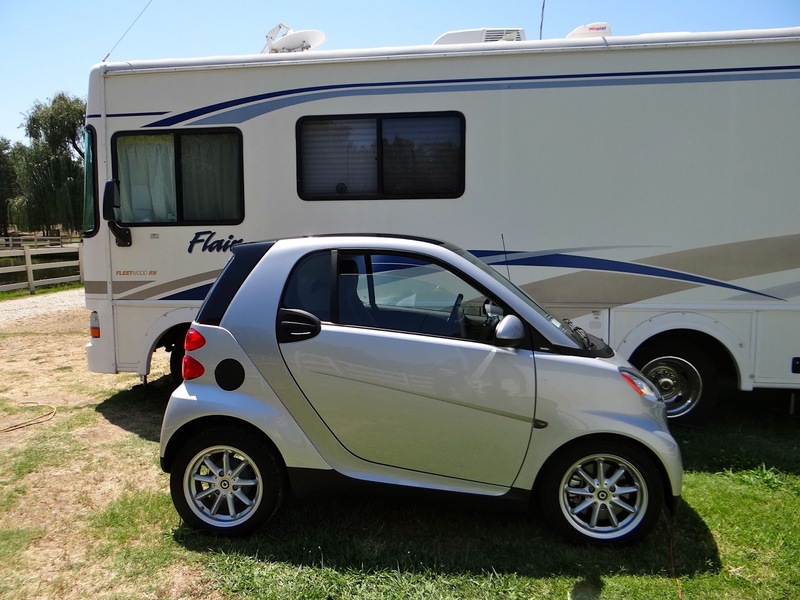 I have to be super vigilant about all the ramifications of driving a Class A and towing (all four wheels down according to the owners manual for the Smart Car). The height and width of the rig are new to me. So the car behind will be one more thing. Now that is news. Great news. You are almost ready to hit the road. Don't worry, the car will just follow right behind you. Congratulations on the new baby. Thanks for the well wishes. Can't wait to get going. I'm having the Flair tuned up next Monday and maybe Tuesday. Hope to head out sometime in the first week or so of August. Ive heard or read the federal crash results for those cars and they are very positive. In fact they might be safer than most full size autos. Besides its cute! I have a rear camera on my TC that provides and excellent view of my Jeep. I put white tape on the Jeep steering wheel to aid in identifying steering wobble. I love to see that tape dead still while going 65 MPH. 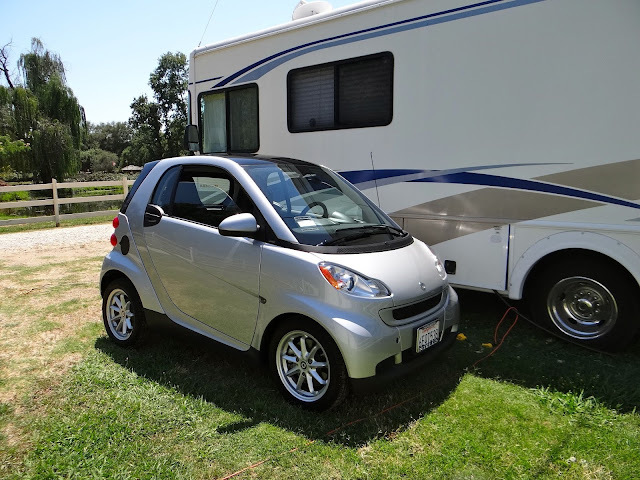 We purchased a new 2009 Smart car just for towing " flat four". Owners manual says "Yes"! We have towed this over15000 miles with no problems. No warming up trans. etc. Put the trans in neutral, leave key in ignition accessory position, disconnect battery and you're "Good to go"! One tip: attach a bungy cord from steering wheel to under front seat! This will eliminate a nasty steering wheel back lash on slow tight turns. The car is so lite I dont bother with a brake control. Another tip" When re-connecting the battery, hold down on brake pedal before turning key to on position! The transmission has to re learn the codes. It takes about 10 seconds. When the "P" park symbol shows on the dash the car will start and you are finished. Hope this helps! I had to learn the hard way!